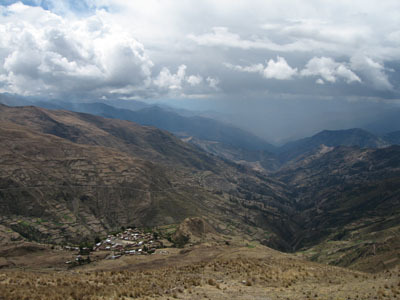 Approximately 148 km from La Paz at an altitude of 2.711 meters above sea level lies the head of the Sorata valley. 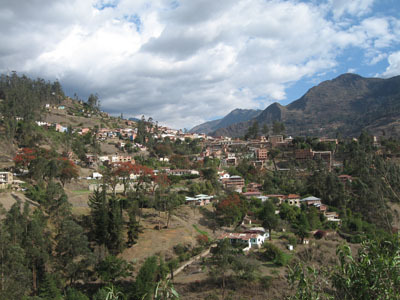 Sorata has a distinctly pre-Hispanic flavor with its irregularly sloping fields, but also hosts many fine colonial constructions. 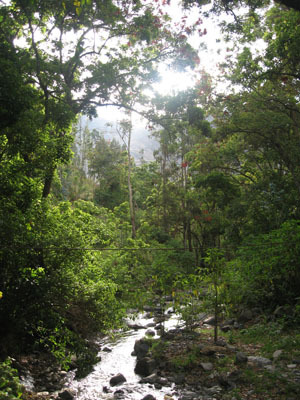 Many writers consider it an earthly paradise due to its diversity of diferent landscapes within the region. Sorata´s diverse geographical surroundings make it an ideal base for treks and mountain bike excursions both up to the towering peaks and down into the cloud forest. Local attractions include the Gruta de San Pedro, a cave with a large subterranean pool at the bottom, the Camino del Oro and others. 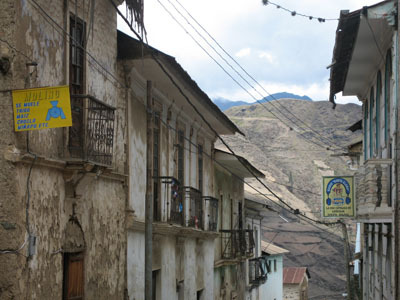 Sorata is most famous for being a base camp for hikes into the towering snow covered peaks that loom above this balmy village. 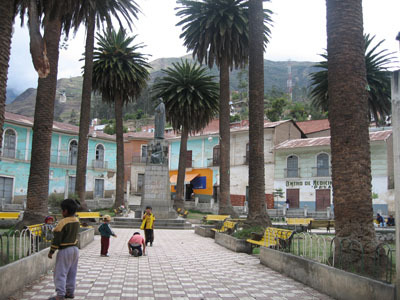 Local artwork and crafts include weavings, sweaters, hats, gloves, and alpaca wool panels of landscapes made famous by the NGO Artesania Sorata which has two offices on Calle Sagarnaga in La Paz. This marks the beginning of the towering Cordillera Real mountain range. Forms together with the Mt. Ancohuma a massif of thirty high peaks. From its top you can enjoy an awe inspiring view over the Yungas region and the sweltering Amazon jungle on the one side and on the other side Sorata, El Altiplano and the Titicaca Lake. 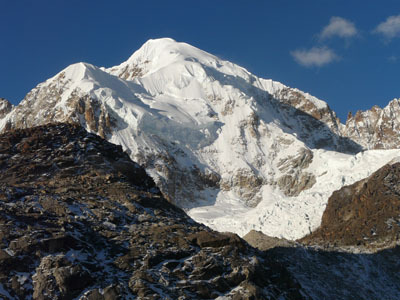 Its top is composed of firm massifs, glaciers and crevasse. The tiny village hosts a gorgeous church and collection of colonial paintings. The local vegetation with deformed trees gives to the place a myterious and picturesque atmosphere. Known as La Gruta de San Pedro, this cave hosts a beautiful underground pool at its bottom. Visitors can appreciate beautiful stalactites and stalagmites that have formed over tens of thousands of years. According to a legend there is a submerged Incan treasure at the bottom of the lake which has a secret exit far down in the Amazon below. The crystalline cascades of San Cristóbal river offer great sport fishing, canyoning, and the observation of the diversity of fauna and flora. 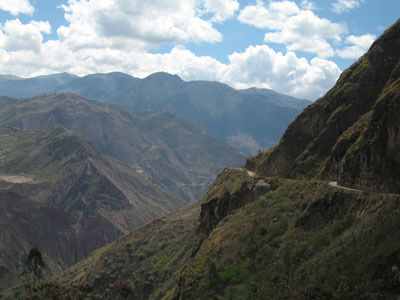 Numerous pre-Colombian trails arrive to and depart from Sorata to the altiplano and to the tropical valleys of the Yungas and the jungles below. 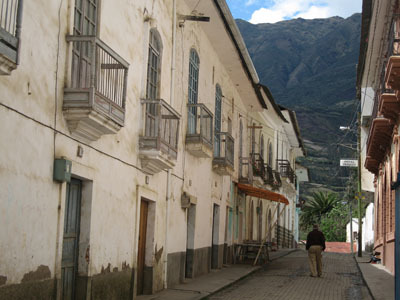 The famous Camino del Oro is a 7 day trek that leads from Sorata down through Tipuani to the jungle town of Guanay. Equally challenging is the Pre-Colombian Kallawaya trail (8 to 14 days), to the north into the mysterious Apolobamba mountain range. Patron Saint festival: 4 de Septiembre - locals parade in folkloric dress with music, dance and typical foods.